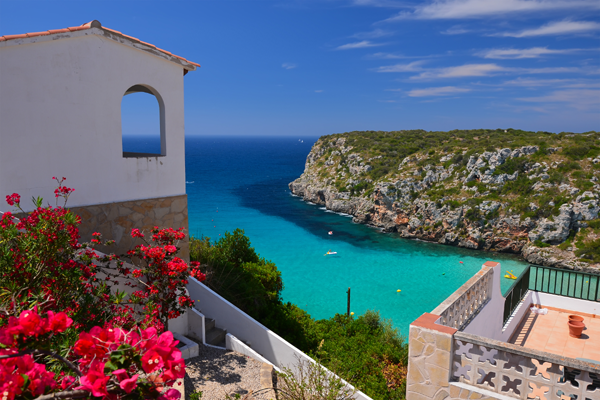 Menorca is the second largest Balearic Island and despite its size still retains a lovely relaxing atmosphere without massive commercialism. 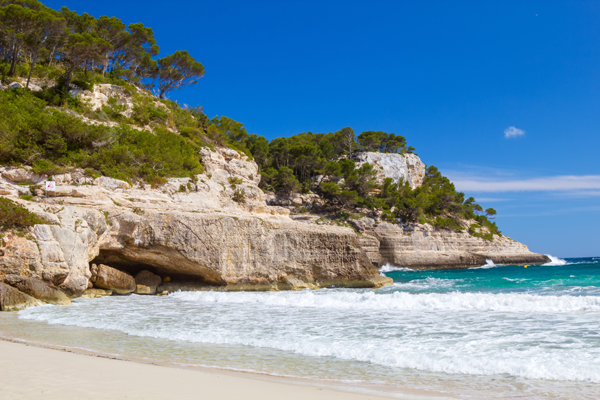 Holidays in Menorca are popular with families and couples looking for a place to relax without the noise of the young and lively crowd, so if you prefer a tranquil break, there are plenty of beaches, quiet villages and coves that will easily do the trick. The island offers some breathtaking scenery with small craggy coves to long sandy beaches and a lush green background from the hills and mountains, it really is a beautiful place to enjoy a holiday and with over 100 beaches, you will soon find your own little piece of paradise. 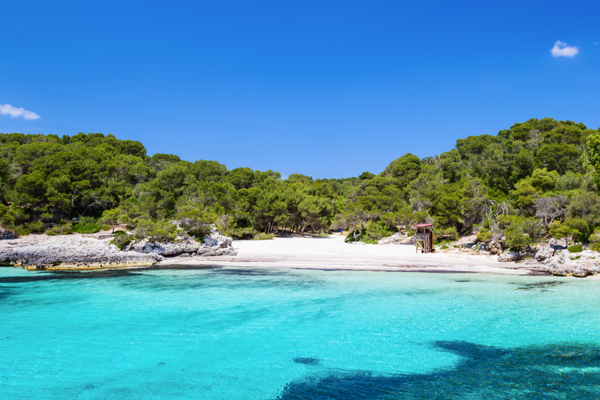 The island of Menorca enjoys a lovely climate and is a great destination between April and October with temperatures peaking in July and August at around 30ºc. 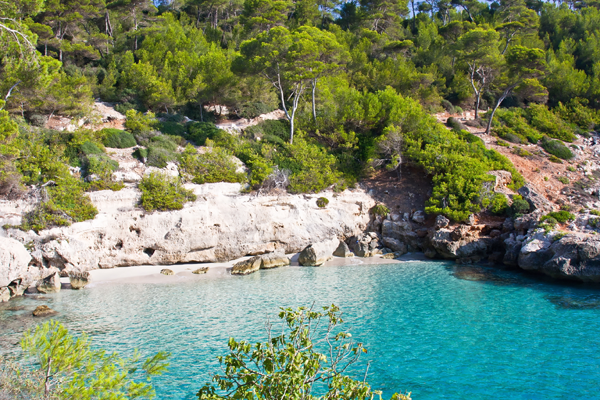 The soft sands with the shallow waters of the Mediterranean make Menorca holidays very popular with young families. Many hotels and apartments have been built in a family friendly style where low rise whitewashed buildings dot around the pretty landscape. Many of the accommodations have kids clubs and some even have mini water parks. Menorca has plenty of things to see and do, the harbour in Mahon, the islands main town, is a great place to visit where you will find local fisherman landing the catch of the day, or you can sample one of the lovely seafood restaurants for a spot of lunch or an evening meal or just enjoy a nice glass of Sangria whilst watching the sun go down over the fabulous harbour. The resort of Binibeca is another popular trip where people come to see the architecture which is a series of whitewashed buildings set on different levels. The second town of Ciutadella has a lovely square and plenty of shops and stalls where you can pick up a souvenir or gift for family back home. There are also two main water parks on the island ideal for a day out that all the family can enjoy. Cala ‘n’ Porter is famed for its fantastic cliff top position and is great for wining and dining over stunning views out to sea. 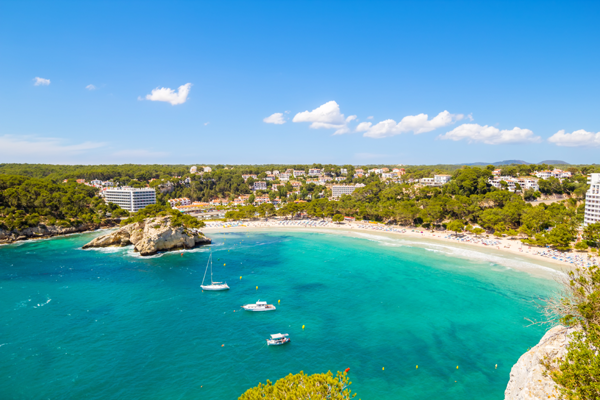 The resorts of Menorca offer a relaxing nightlife scene where family friendly bars and restaurants offer a wide choice of seafood and Spanish favourites as well as the usual international fare. The resorts have a small number of shops but for a bigger choice hire a car or jump on the local buses and visit Mahon or Ciutadella for a day out. Have a browse around our site or why not give us a call free today on 0800 091 4935 for a wide range of Menorca holidays and one of our friendly UK based team will aim to get you the best deal possible.